As you might have guessed, a lot of progress at school is achieved through children’s eyes. 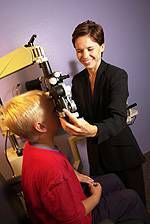 Yet interestingly, in spite of this well-known correlation between vision and learning, a lot of people underestimate or are perhaps unaware of the significance of vision problems, and don’t include comprehensive eye exams as part of their child’s back to school health check-up. It’s important to know that because vision in kids changes, regular eye and vision care is central to academic success and overall happiness and wellbeing. Kids, it’s worth noting, have a truly astounding ability to function despite having a vision problem. As children go through school, it becomes even more important to keep an eye on their eyesight. Some warning symptoms include reversing numbers or letters, watery eyes and frequent eye rubbing, squinting, head tilting, and avoiding detailed work. Impaired eyesight and growing demands on the eyes, like smaller print in textbooks or additional homework can significantly change his/her performance. Technology that’s recently been integrated into the classroom, like interactive whiteboards, can also potentially exacerbate previously unknown vision issues. Without adequate vision, students may suffer not only in the classroom, but also mentally, physically and emotionally. If you’re the parent of a glasses-wearing child, now is also a good time to see if they need new glasses. Even though your child might be able to see clearly wearing his or her current pair of glasses, they may fit poorly or perhaps the lenses no longer align with the child’s eyes due to normal growth. If kids don’t feel comfortable in their glasses, they will probably avoid wearing them. So make an appointment to see us when you’re gearing up for the new school year. We’ll do our very best to help all the kids we treat start the year afresh with great vision.